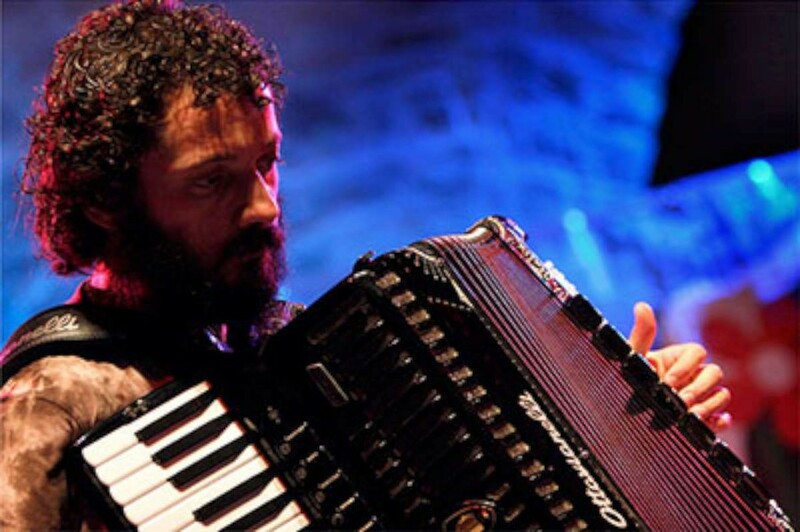 UKAAT (United Kingdom Association of Accordion Teachers) are very lucky to have secured the contribution of top Jazz accordionist Simone Zanchini at their first ever accordion teachers’ workshop to be held at the Royal Academy of Music on February 7th 2016. Zanchini made an incredible impact on UK audiences when he played at the London Accordion Festival in 2001 along with the saxophone ensemble Hallo Mr. Sax. It was here that Zanchini first delighted the late great Frank Marocco which led to a wonderful collaborative album called Be-Bop Buffet. Considered one of the most interesting and innovative accordion player on the international scene, his research moves between the boundaries of contemporary music, acoustic and electronic sound experimentation, mixing together experiences and super-refined influences issuing in an absolutely personal approach to improvisation materials. Eclectic musician, performs an intense concert activity with groups of diverse musical backgrounds (improvisation, contemporary music, jazz, classical). Graduated with honors in classical accordion at the Conservatory G. Rossini in Pesaro, under Maestro Sergio Scappini. He has performed in several Festivals in Italy (Clusone Jazz, Umbria Jazz, Tivoli Jazz, Jazz in the Time-Berchidda, Sant’Anna Arresi, Barga Jazz, Mara Jazz, Jazz-in’it, Ravenna Festival, Rossini Opera Festival, Siena Jazz, Roccella Jonica etc.) and in the mainly international Festivals (France, Austria, Germany, England, Holland, Sweden, Denmark, Finland, Slovenia, Croatia, Macedonia, Spain, England, Norway, Russia, Tunisia, Lebanon, India, Venezuela, Japan, etc.). He has collaborated with many internationally renowned musicians from different musical backgrounds such as: Thomas Clausen, Gianluigi Trovesi, Javier Girotto, Marco Tamburini, Massimo Manzi, Tamara Obrovac, Krunoslav Levacic, Vasko Atanasovski, Paul Fresu, Antonello Salis, Han Bennink, Art Van Damme, Bruno Tommaso, Ettore Fioravanti, Mario Marzi, Michele Rabbia, Andrea Dulbecco, Giovanni Tommaso, Gabriele Mirabassi, Frank Marocco, Bill Evans, Adam Nussbaum, Jim Black. Since 1999 he also collaborates with the Soloists of the Orchestra of Teatro alla Scala in Milanand has toured regularly with this ensemble. Aside from musical performances and reasearch, Zanchini also leads accordion’s workshops and collective impro. His collaboration with Marocco Be-bop Buffet came in 2006 (Wide Sound) and was a model of Bebop language expressed through the accordion. In 2009 Better Alone…! (Silta Records) a solo project where prove all tone colours of his instrument through the use of a particular midi accordion, live electronics and laptop, in the same year he published also Fuga per Art Jazz 5et (DodiciLune Records), the unique tribute work of Zanchini, a tribute to his great Master and one of the greatest exponents of the jazz accordion: Art Van Damme. In 2010 he published a new Project with Ratko Zjaca (guitar), Martin Gjakonovski (bass) and Adam Nussbaum (drums): The Way We Talk (In + Out Records). In May 2012 the latest Zanchini project was released: MY ACCORDION’S CONCEPT (Silta Records) a project built up on radical improvisation with the acoustic accordion and live electronics, a brave attempt to subvert the common code of expression through the accordion. In December 2012 he recorded a new album with the ZZ Quartet (Zjaca, Zanchini, Nussbaum, Gjakonovski). His workshop will help and encourage teachers towards teaching the basis of jazz improvisation. Accordion teachers are often asked to teach jazz to students and a UKAAT survey showed this to be one of the most popular areas that teachers wanted to extend their skills in. The workshop will help teachers give their students the best possible start towards this. Attendees are encouraged to bring their accordions as much can be learned through trying things out without fear of being judged. The jazz theme will be extended further with an insight into Jazz using free bass by the UK’s own Karen Street. No need to be a member to attend. All accordion teachers and accordionists welcome. Please see link to purchase ticket below.